When you stay at The Ritz-Carlton Bacara, Santa Barbara in Goleta, you'll be on the beach, within a 5-minute drive of Sandpiper Golf Club and Goleta Butterfly Grove. This 5-star hotel is 3.2 mi (5.2 km) from Glen Annie Golf Club and 6.4 mi (10.2 km) from University of California-Santa Barbara. Make yourself at home in one of the 87 air-conditioned rooms featuring LCD televisions. Complimentary wireless Internet access keeps you connected, and cable programming is available for your entertainment. Bathrooms with showers are provided. Conveniences include phones with free local calls, and housekeeping is provided daily. When you stay at Super 8 by Wyndham Santa Barbara/Goleta in Goleta, you'll be near the airport, within a 10-minute drive of University of California-Santa Barbara and Goleta Beach. This motel is 3.4 mi (5.5 km) from Los Padres National Forest and 4.7 mi (7.5 km) from Upper State Street. When you stay at Courtyard Santa Barbara Goleta in Goleta, you'll be near the beach, within a 10-minute drive of University of California-Santa Barbara and Goleta Beach. This hotel is 4.4 mi (7.1 km) from Los Padres National Forest and 7.3 mi (11.8 km) from Upper State Street. Make yourself at home in one of the 87 guestrooms featuring refrigerators and DVD players. Your room comes with a pillowtop bed, and all rooms are furnished with queen sofa beds. Rooms have private balconies or patios. Complimentary wireless Internet access keeps you connected, and cable programming is available for your entertainment. Private bathrooms with shower/tub combinations feature rainfall showerheads and hair dryers. If your idea of the ultimate Southern California retreat is longboards, poolside sangria and coastal cuisine, you’ve found your place in the sun. 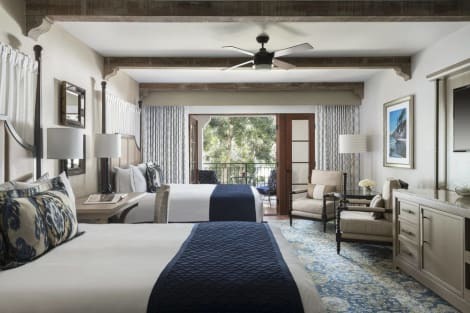 Here at Kimpton Goodland, we have a Golden State-of-mind attitude and 158 newly refurbished beach-chic guestrooms and suites for a postcard-perfect Santa Barbara stay. With Goleta Beach and Stearns Wharf an easy bike ride away and an outdoor heated pool and charming meeting spaces right on-site, you’ll discover it’s all good at Kimpton Goodland. lastminute.com has a fantastic range of hotels in Goleta, with everything from cheap hotels to luxurious five star accommodation available. We like to live up to our last minute name so remember you can book any one of our excellent Goleta hotels up until midnight and stay the same night.